Savoir Beds: THE WORLDS MOST LUXURIOUS PET BEDS! THE WORLDS MOST LUXURIOUS PET BEDS! Savoir Beds are renowned for producing the world’s most luxurious beds, so it’s only fitting that our four legged friends can now also reap the rewards from sleeping on a Savoir! We all have a special place in our heart for our extra family member with four legs and tail, so Savoir are excited to announce the launch of our first pet bedding range meaning dogs and cats can experience a Savoir of their very own! 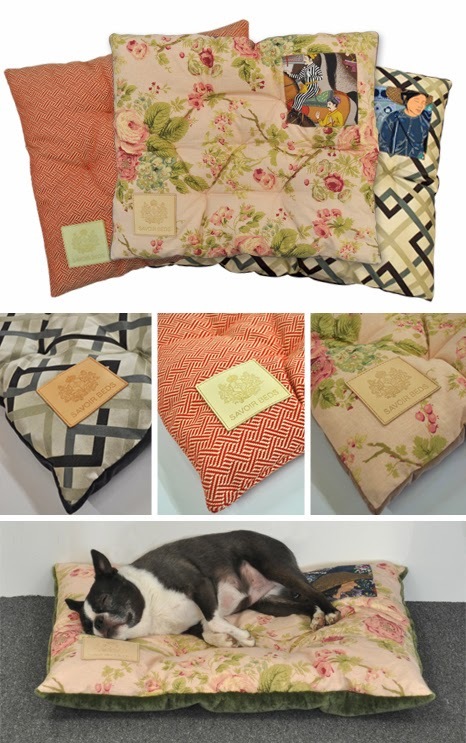 Covers are made with beautiful fabrics from luxury collections, making these stunning pet beds both a decorative and practical addition to every home. The fillings are naturally natural, using 100% lambs’ wool to provide the ultimate in feline or canine comfort. At last, our four legged friends can have a taste of the high life, sleeping on their very own mini Savoir. A selection of ready made beds can be seen in our London showrooms, or we can also arrange for pet beds to be custom made to compliment your own style and tailored to your bespoke requirements. The first few pet beds will come complete with limited edition Savoir leather labels, crafted by the exclusive leather company Ettinger with a specially designed Savoir crest. These exquisitely designed pet beds are currently available a size of 65x 65cm. So, our resident Savoir pooch, Spooky, will not be the only lucky mutt to experience a lavish night’s sleep for much longer. Lovingly hand crafted in our London Bedworks, the Savoir dog and cat range will be available for your pet from Friday the 20th December. Ready to purchase just in time for Christmas from our Wigmore Street and Harrods showrooms in London and with prices starting from £250, make sure your pet will have the finest nights sleep this Christmas!